On Feb. 1, mining companies and mining suppliers gathered for the first Beyond Digital Transformation conference in Sudbury, Ont., to discuss the changing technological needs of mines and to network. The conference was hosted by Partners in Achieving Change Excellence (PACE), a change management company. Representatives from four mining companies – Barrick Gold, Glencore, Vale and Dundee Precious Metals – gave presentations to the 260 people in attendance at the one-day event. “I think it’s more about answering the question: Why should I need my organization transformed?” said Patrick Marshall, manager, automation projects, innovation, at Barrick Gold. He noted that half the Fortune 500 or merged since 2000, saying that their demise came because they didn’t make changes in technology. A new way of mining must be imagined. 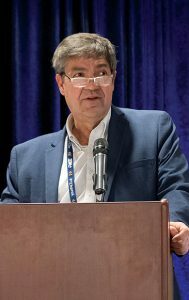 “If we were to wipe the slate clean and rethink how we build a mine and operate mines – erase all the assumptions, redesign the system – I think we can put together a very different system,” Marshall said. To make these changes, mining companies are looking for partners to work with in designing and implementing new technologies. They discovered part of the problem was inefficient data handling. The company recognized a shortfall in computer skills. “We realized we needed to move quickly towards the digital frontier, and understand how we were going to use digitization to improve our mine,” said McCarthy. Barrick tasked out equipment and jobs to people, until all of the people were busy and called it digital task assignment co-ordination. This system improved flexibility and reliability. 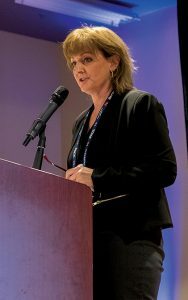 Samantha Espley, director of Vale Base Metals’ Technical Excellence Centre of Mining and Mineral Processing, addressed the business side of change. But change isn’t always easy. As with Barrick Gold and Glencore, engaging the employees was critical, bringing together the IT department, operating department and capital projects team. To control the waste, Espley believes data collection and relatability is key. New technology must improve the production of a mine. Espley added that women will be a big part of the change. The keynote speaker was Rick Howes, president and CEO of Dundee Precious Metals. He believes it’s up to the leadership within the mining industry to lead the way. Technology, Howes said, is changing all businesses. He thinks the mining industry can use many of these new technologies: big data and advanced analytics, augmented and virtual reality, cloud computing and systems integration, advanced simulation, industrial internet of things, sensors, drones, machine learning and AI, advanced robotics, and chainblock technology. He believes these technologies will make the industry more flexible to market variations. “The threat is that If you don’t move quickly enough to adapt, you risk becoming obsolete,” Howes said. “And the opportunity is that you transform the way you do things for better, safer, more efficient, sustainable mining. Kevin McAuley, manager of sustainable development and innovation at Glencore and Greg Sandblom, operations and business technology leader, Sudbury Integrated Nickel, Glencore also give a presentation. Sandblom said one biggest problems and accomplishments was getting IT and operations to work together. The next PACE conference will be held in early February 2019 and extended to two days.